Many food spots have popped up all over Pasig City most especially in the Brgy. Kapitolyo area. Even though the place is near from where we live, we hardly frequent the area. So, I happily trolled around the internet to scour food spots that serve comfort food in a clean, relaxing place for last weekend’s dinner. 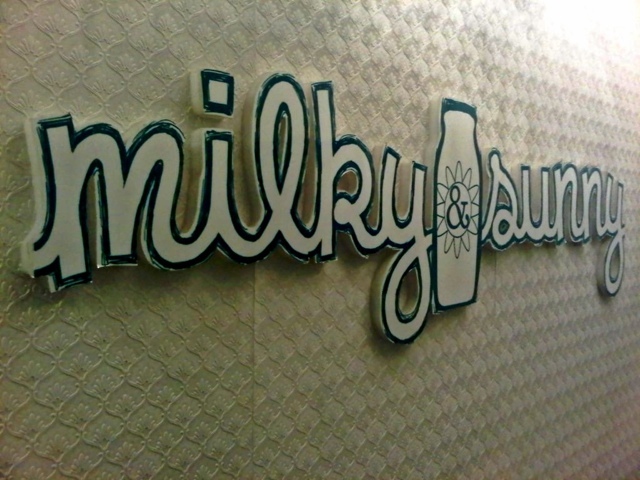 We ended up going to a relatively new establishment called, “Milky & Sunny”. This restaurant has been mentioned countless times on my Twitter and Instagram timelines which got me curious. 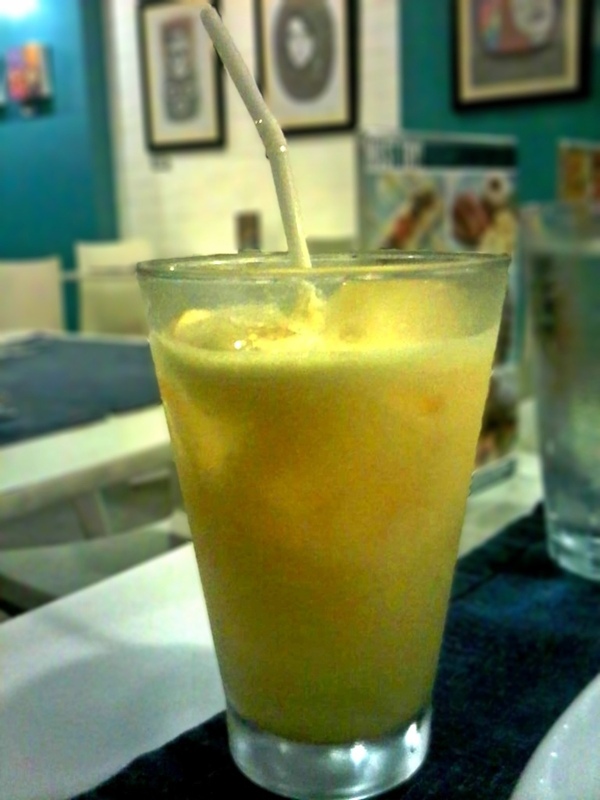 Milky & Sunny is not so hard to find since it is located along the main road (East Capitol Drive) of Brgy. 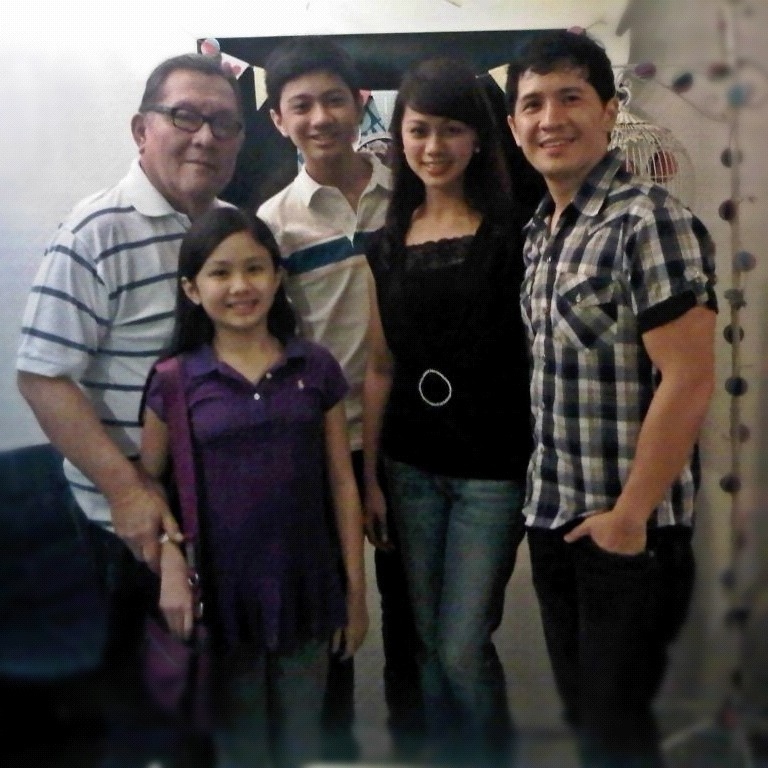 Kapitolyo and practically shares the area with other well-known restaurants. Good thing the place wasn’t full when we dropped by, so parking was not a problem. It is impossible to miss it with its well-lit signage at night. As soon as I entered the establishment, I suddenly remembered the original “Heaven & Eggs” restaurants of old. It also gave off a feel that was quite similar to a fairly well-known food stop in QC called, “Nomnomnom”. 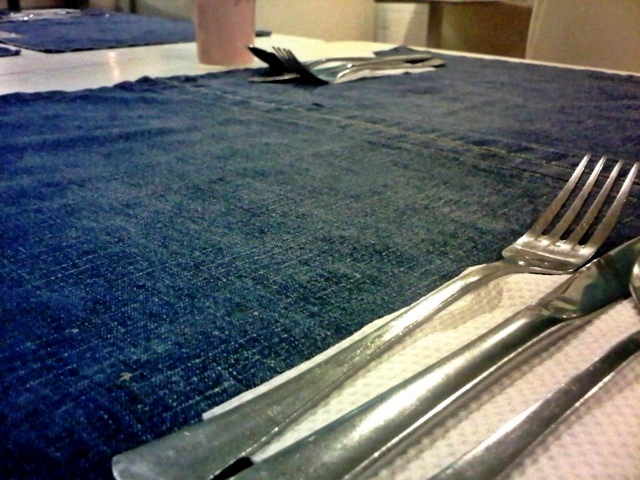 The whole place is adorned with an assortment of blue and white decors – from tables, chairs, walls, placemats and even the bric-a-bracs. 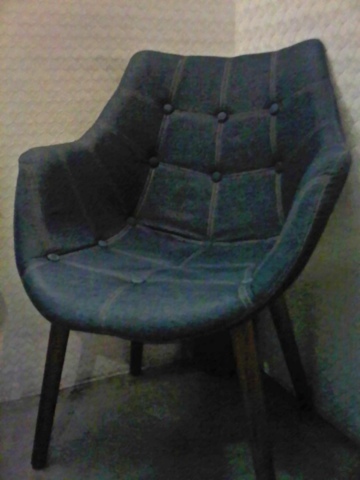 Perfect for our simple and intimate family dinner. You’ll see this upon entering. 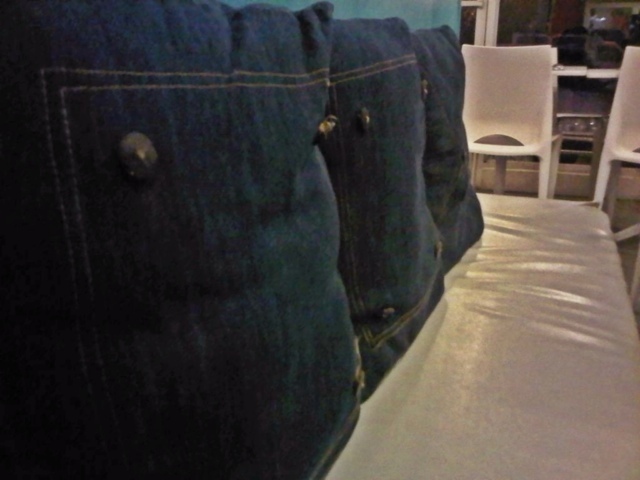 Maong placemats, throw pillows and chairs. 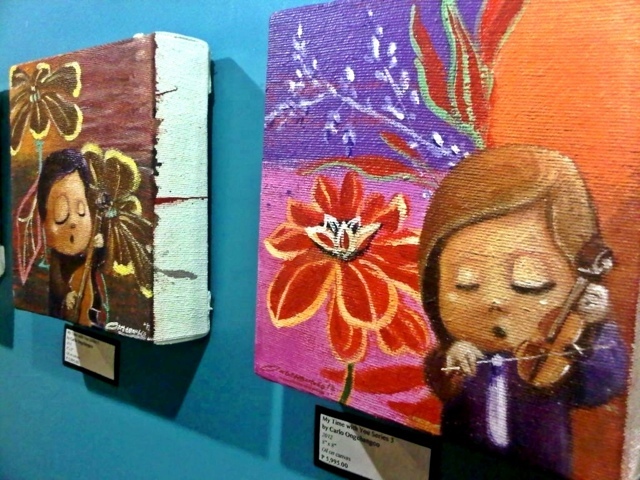 The art works on the walls are not just for display, it’s actually for sale, too! When we got settled, we checked their menu and ordered a few dishes that we figured were comforting. Off the bat, most of us decided to try their Rice and Egg Meals. 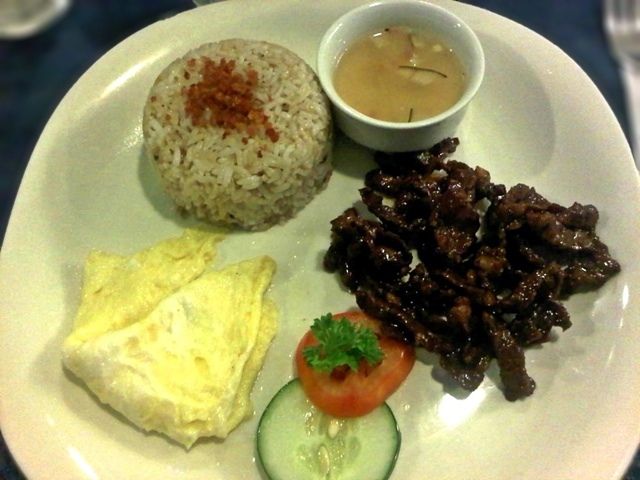 My husband and I both ordered Tapa (Php160.00). It was tad sweet for me. Or it could be because I’m just used to my traditional salt and pepper Tapa preparation. But it was OK… I think my husband liked it more. 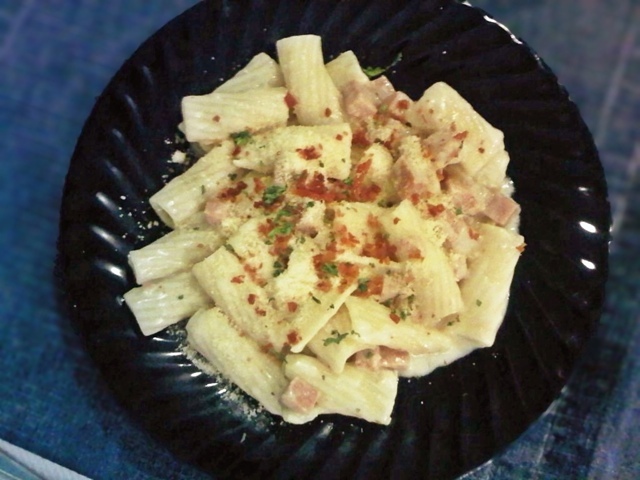 Our growing boy had Bacon and Spam Pasta (Php180.00). I was not able to try this but it looked delicious. It had crushed bacon pieces and diced spam. According to my son, the creaminess was just right but it lacked a bit of saltiness. Perhaps a sprinkle of parmesan cheese can easily remedy that. 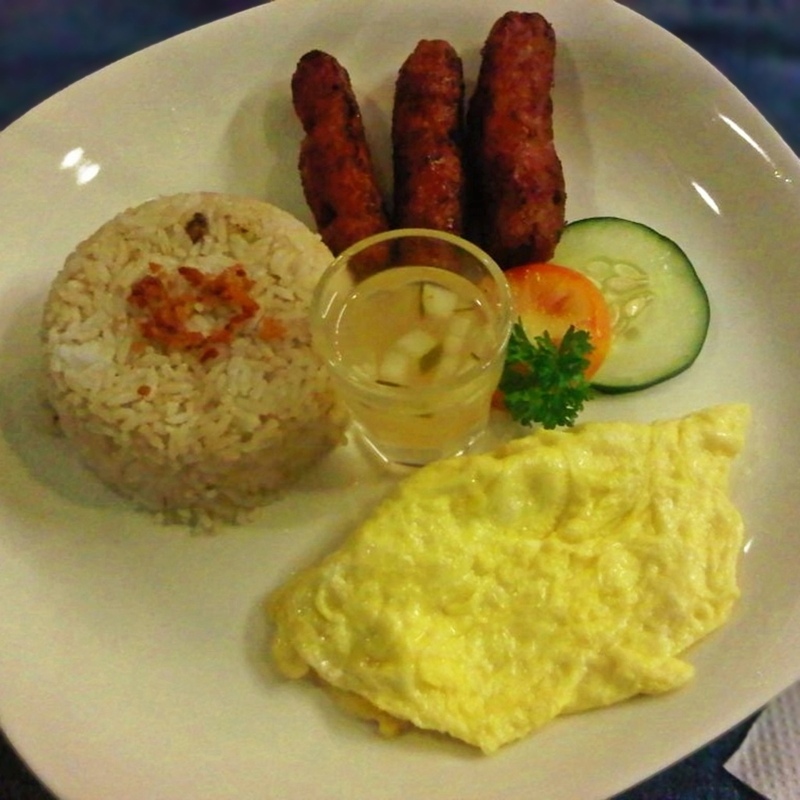 He also had an additional order of Longganisa Rice and Egg meal (Php120.00). If you enjoy sweet (hamonado) longganisa, you will enjoy this one. Our daughter, on the other hand, had Tocino (Php120.00). 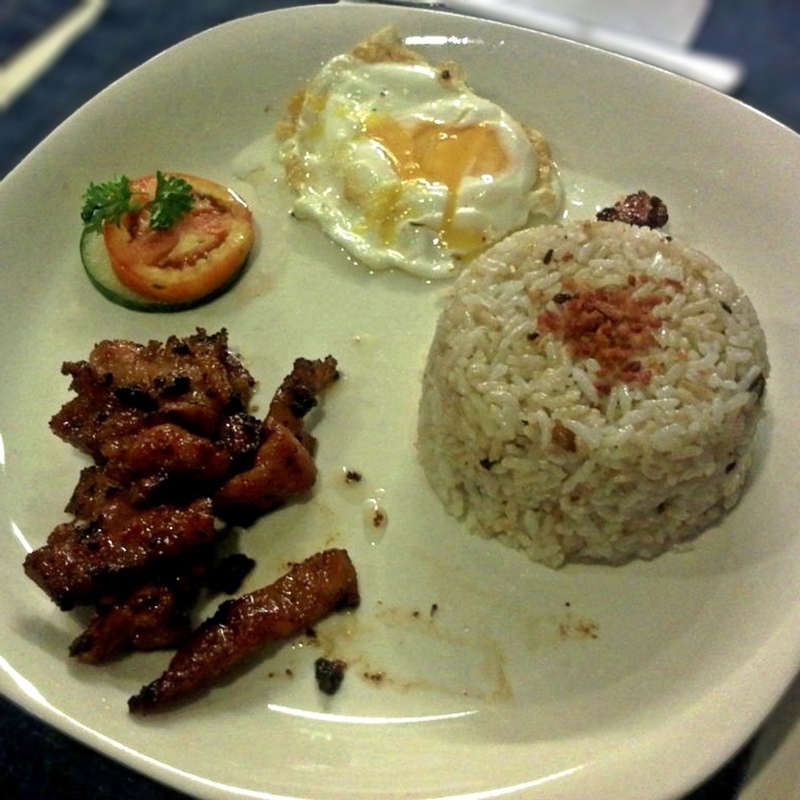 Just your typical sweet tocino, a cup of garlic rice and one sunny side-up egg. She enjoyed it a lot. She’s a tocino lover so go figure. 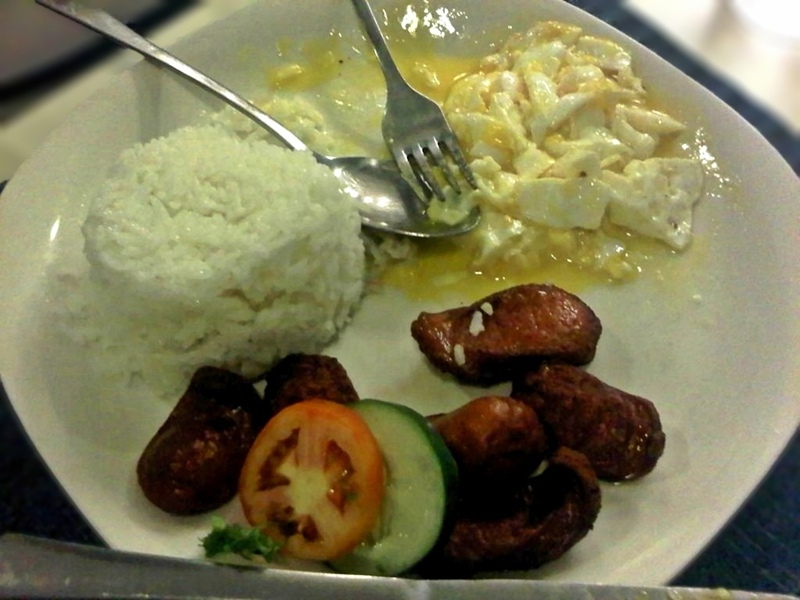 As for my father-in-law who loves sausages, he opted for the Hungarian Sausage with one sunny side-up egg (Php150.00). He asked for an extra order of egg. My shot clearly didn’t do justice to the dish. The sausage looked burnt here. But according to my father-in-law, it was cooked just right and tasted fine. We also tried some of their pancakes. Bananarama for my father-in-law and Strawberry Cream Cheese for us. 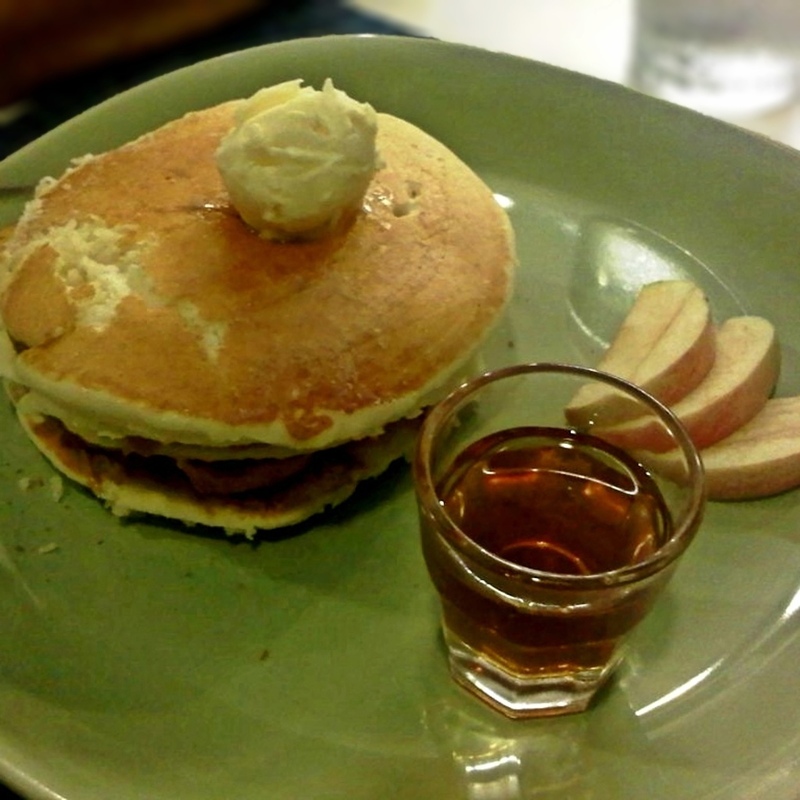 Bananarama (Php140.00) – the dallop of peanut butter in between made it more of a sandwich than a pancake. 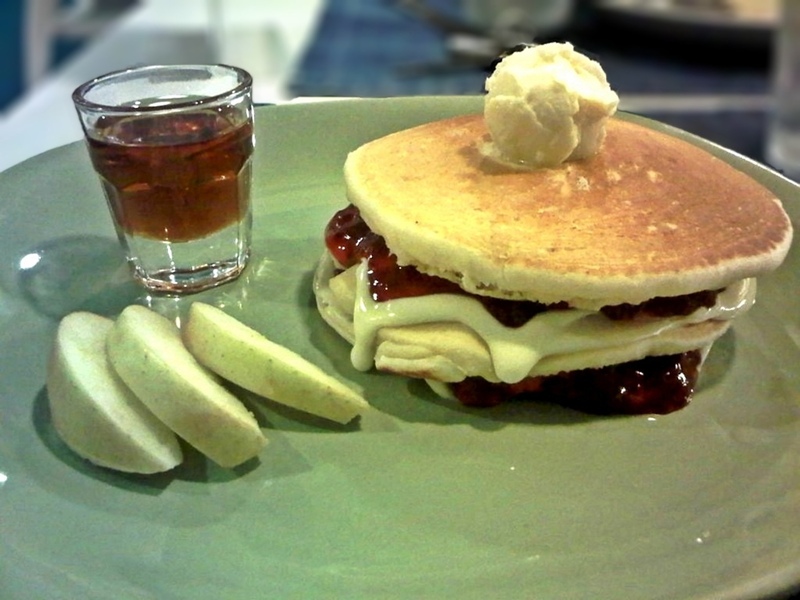 Strawberry Cream Cheese (Php140.00) – this I enjoyed eating! The oozing strawberry made it really delicious! It tasted very homemade. You can tell by its color and consistency that the strawberry is freshly made. It has that soury taste that goes perfectly well with the pancake syrup. Fantastic! 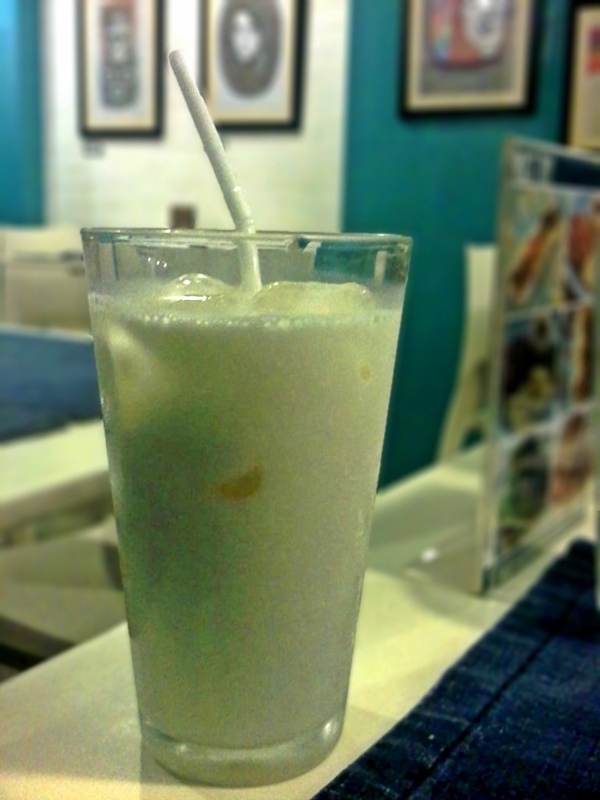 For drinks, we had fresh orange juice (Php100.00) and fresh milk (Php60.00). The food was good. My family enjoyed it. I did, too. I just wish they’d serve the rice meals in bigger portions. The Dreyfuses after a filling dinner.